My friend Alani came to me and asked if I was interested in making a baby shower cake that she was throwing for her friend... "Yes!" Why wouldn't I? With a small number of girls attending, I decided to make a two layered 8" cake. The flavor chosen was a milk chocolate cake filled with strawberry puree. 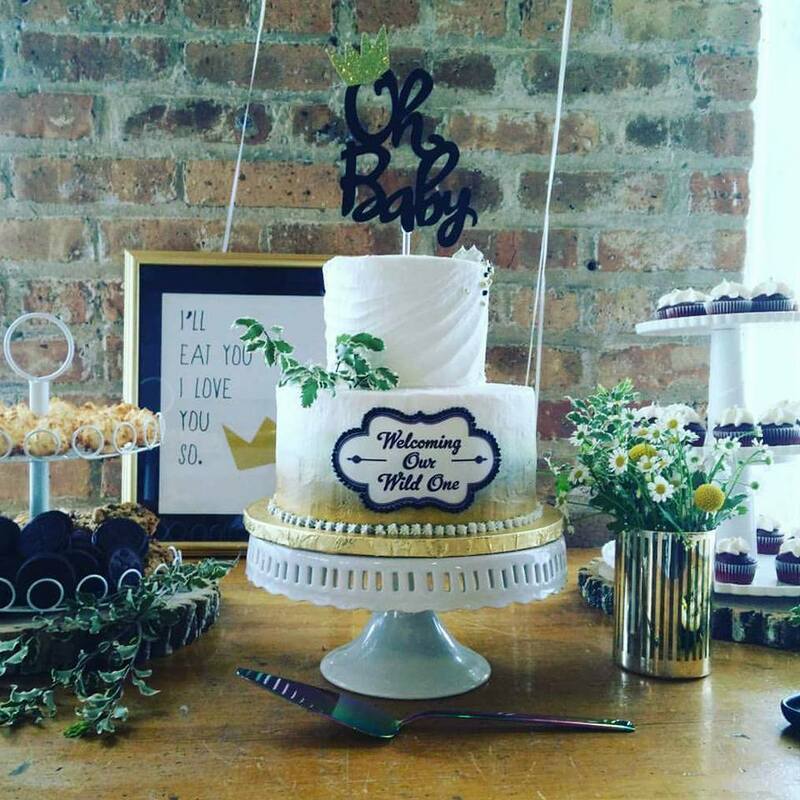 For the look of the cake, it was to reflect the jungle theme. I decided to focus on the giraffe that was used on the invitations. I automatically had a vision of a giraffe joey laying on its tummy. How cute! 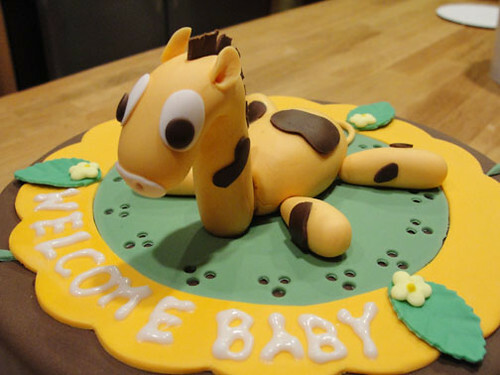 I first started with each part of the giraffe and shaped it out of a 50/50 mixture of gumpaste and fondant. A lollipop stick was used for the structure of the neck and head. I used a styrofoam cup to prop up the giraffe head as it dried. I shaped the body and made indentations where the limbs would fit, and left these to harden a day prior to baking. My basic chocolate cake recipe was used for the 2 layers of cake, which was cooled completely and placed in the fridge for 15 mins before handling. Chocolate is the hardest cake to carve, handle, or to ice because of it's super soft texture. Chilling it for a few minutes helps with that problem. I torted the two layers and filled each one with a generous scoop of strawberry puree filling. I made sure leave a good amount of chunky bits for full strawberry experience. The layers of cakes were stacked high and leveled before I thinly iced the entire cake with a smooth, velvety buttercream. The cake was then covered with my fave chocolate fondant and smoothed to perfection. Green colored vanilla fondant was then rolled out thinly for the eyelet circle and various blades of grass that accented the sides. I used a ribbon cutter to create the yellow frame around the eyelet circle for a lovely contrast of colors. 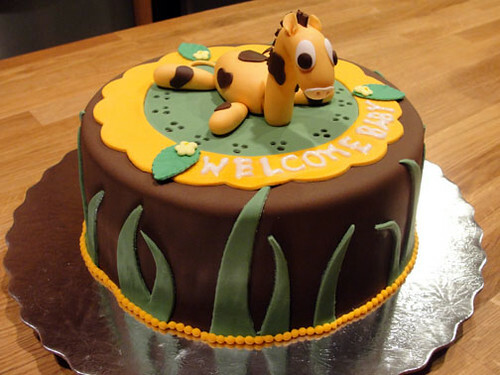 The giraffe was centered on the cake and sugar-glued into position. To finish of the cake, a few more leaves, royal icing drop flowers, and a beading of yellow fondant around the base. Congrats to Steffanie! The cake tasted just as great as it looked and quickly became the centerpiece of our party (err, i mean other than the guest of honor!) Great Job! thanks again! The cake was a hit! I couldn't have pictured a better cake, it was perfect for the theme and tasted delicious!! Thanks a lot! Keep it up, you are talented!! The cake was for me! And I LOVED it!!!! Great idea, it was the cutest cake I ever had! It was also very yummy too! Thank you!!! Good Job, keep up the great work! 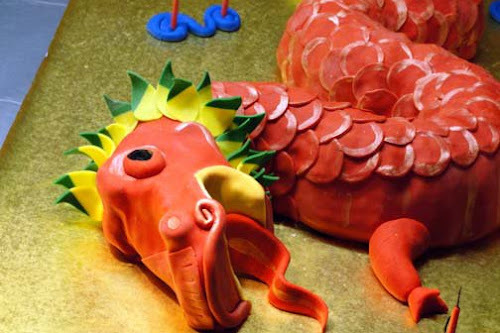 The cake was astonishing! The minute everyone walked in the room, that was the first thing we noticed. It was amazingly beautiful and well decorated. The best part of it all is that it was de-li-cious! My hats off the the baker!